Ian Rapoport of NFL Network reports former Chiefs linebacker Justin Houston is signing with the Colts. Adam Schefter of ESPN adds the deal will be for two years and $24 million. Houston was released by the Chiefs earlier this off-season since they could free up $14 million in cap space by doing so. The 30-year-old certainly helps beef up Indy’s defense. Matt Verderame of FanSided reported Monday afternoon that the Chiefs are releasing veteran linebacker Justin Houston. There had been speculation last week that Houston could be traded but there apparently wasn’t enough interest from other teams. He was scheduled to make $15.25 million in base salary in 2019, and to cost $21.1 million against the cap. The move will result in a $7.1 million cap charge for Kansas City. Houston recorded 11 sacks in 14 games (including postseason) during the 2018 season. He has spent his entire eight year career with the Chiefs since they selected him in the third round of the 2011 draft. His best season came when he recorded a league-best 22 sacks in 2014. With linebacker Dee Ford likely to receive the franchise tag and Houston set to make $15.25 million in base salary in 2019, and to cost $21.1 million against the cap, it makes sense that the team would be willing to move the veteran. Houston recorded 11 sacks in 14 games (including postseason) during the 2018 season. 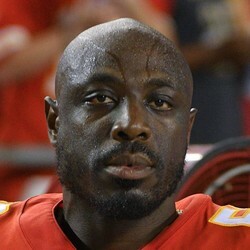 He has spent his entire eight year career with the Chiefs since they selected him in the third round of the 2011 draft. Chiefs linebacker Justin Houston recorded two tackles with two sacks, one fumble recovery, and one pass defensed in Saturday’s 31-13 playoff win over the Colts. Houston’s pass rush played a big part in helping advance the Chiefs to the AFC Championship game. They will host the Patriots Sunday night. Chiefs linebacker Justin Houston recorded five tackles (two solo) and 1.5 sacks in Thursday night’s 29-28 loss to the Chargers. Houston is now up to seven sacks in 10 games this season. He will look to add to that total in Week 16 against the Ravens.